Having problems with your computer performance? Is it too slow? Then here’s a software I would like to share with you- Uniblue Disk Rescue 2009. It features a powerful disk defragmentation engine and defrag scheduler, it also improves disk read/write speeds, improving your computer’s bottom line performance. 1. Firstly, Go to the promotion page. 2. Now, fill in your name and email and then Click on Submit. 3. Once done, you’ll receive an email containing the License Key. 4. 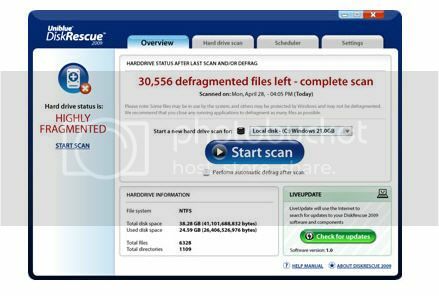 Download UniBlue DiskRescue 2009. 5. After Installation click on the register now button, the registration window will open. Simply enter the key you received in your email. Voila! One year license activated!